"Flowers in a basket are fragrant; listen to me sing a little; sing for a little," lyrics and melodies of Nanniwan, a revolutionary song popular in China, lingered around the Overseas Education College at Jiangsu University March 13. 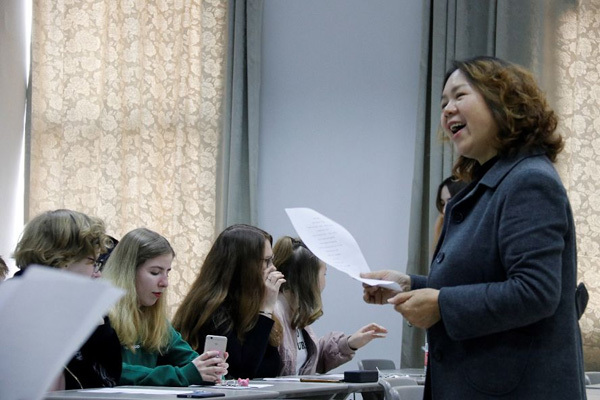 Guided by a vocal music teacher, Russian students attending the pre-college program at Jiangsu University learned to sing the song, one of the most recognizable songs in China. The song's title literally means "south muddy bend" and inspired numerous Chinese people to cope with turbulent war times and become self-sufficient. The traditional folk melody of northern Shaanxi province, along with its lyrics referring to Nanniwan as Jiangnan, implies that the inland area in Northwest China is as prosperous as the region south of the Yangtze River, where the cultivation of rice and the breeding of fish flourish. "I like singing; this is my first Chinese song and I will learn more," said a Russian student eager to share her feelings after practicing Nanniwan. As a way to learn Chinese and also to embrace folk musical art, Jiangsu University held the activity as part of its Experiencing China cultural immersions. Activities on tea art and Chinese writing, as well as visits to surrounding areas will be held in the near future.